Toy Fair Shows Off What's New As Toys R Us Cuts 250 Corporate Jobs : The Two-Way A day before the International Toy Fair opened in New York, Toys R Us announced it was laying off between 10 and 15 percent of its corporate employees. 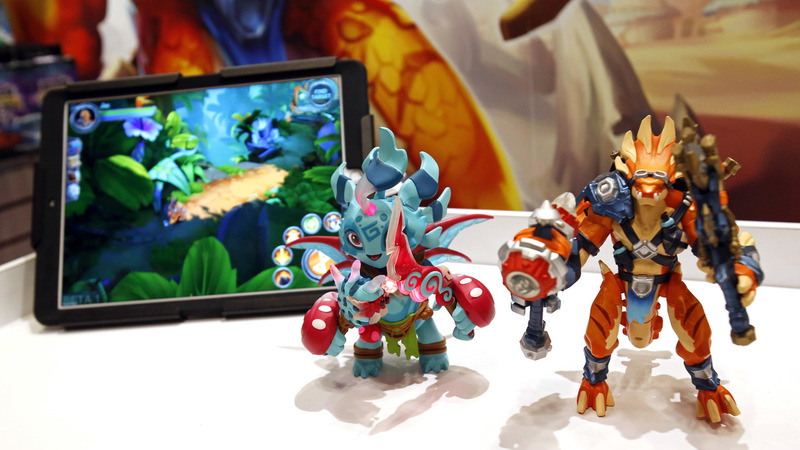 At the International Toy Fair, TOMY International and PlayFusion announced Toys R Us as the exclusive in-store retail launch partner for Lightseekers, the next generation of connected play featuring smart figures, trading cards and more. The 114th North American International Toy Fair boosts a chance for industry players to see "hundreds of thousands of innovative new toys and games before they hit store shelves." To attend the four-day event in New York City must be a lot like being a kid in a candy store — er — make that toy store. At the Jacob K. Javits Convention Center, hundreds of thousands of square feet are dedicated to the "hottest new toys and trends." "Many of the toys and games displayed here are being seen for the very first time — and are likely to top kids' birthday and holiday wish lists throughout the coming year," said Steve Parierb, president and CEO of the U.S. Toy Industry Association. In a statement, industry officials said, "Last year, U.S. toy sales grew 5% and are estimated to be $26 billion. The industry supports more than half a million American jobs and has a total U.S. economic impact of more than $80 billion." But not everything is bright and shiny for toy retailers — toy shopping is shifting from brick-and-mortar stores to online retailers. Toys R Us is one retailer struggling with that change. The company last week laid off between 10 and 15 percent of its corporate employees. "About 250 jobs were eliminated at the Wayne, N.J.-based company, people familiar with the matter said. The layoffs were announced Friday, a day before the toy industry's annual convention kicked off in New York." "The recent changes are not just about cost-containment — our growth plans require us to have the right structure, talent and determination to transform our business and achieve the financial objectives we've set for the company." People simply aren't trekking to the malls that previously helped the toy chain dominate. Plus, savvy competitors like Walmart and Target have tripled their toy aisles & seasonal offerings during holiday season, allowing customers to cross TRU off the store list. Amazon also cuts into sales as a major competitor, but it's particularly painful as Toys "R" Us has historically had trouble getting products to customers. In 2015, they ran out of on-site goods which prompted TRU to try a new inventory algorithm, but ecommerce fulfillment issues were created as they underestimated holiday volume. Other toy companies, and retailers in general, didn't do as well as expected during the holiday season. Toy's R Us CEO David Brandon told The Wall Street Journal, "Like other primarily brick-and-mortar retailers, Toys "R" Us had trouble attracting enough shoppers to stores during the critical holiday season as e-commerce sales continued to pick up speed." The International Toy Fair closes later today. By the time the 2018 show opens, the industry will have a better idea of how retailers adjusted to the lessons learned from this past holiday season's disappointing sales.